It’s our Members’ Show and Tell this Friday! In our last Friday Showcase for 2018, members are invited to bring a project to show. We look forward to welcoming you and sharing something you are working on or have finished this year. Friday Showcase then takes a break over December and January. 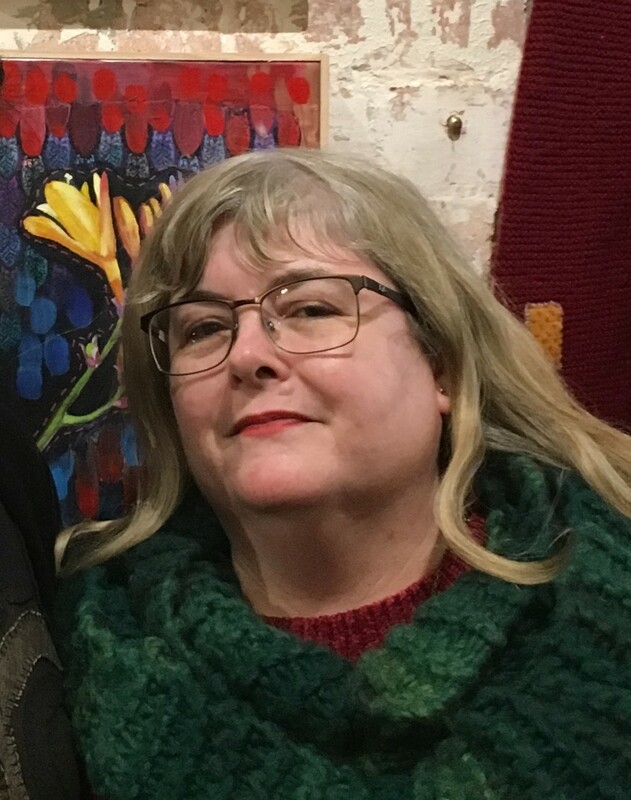 We return in February 2019 with a presentation by Rhonda Langhorne. Friday Showcase is held on the first Friday of most months at our QuiltNSW office, 276 Pitt Street, Sydney, close to Town Hall Station. The Members’ Show and Tell on Friday, November 2, starts at 10am, with an entrance fee of $5 for QuiltNSW members and $10 for guests. We hope to see you on Friday next to enjoy a morning which traditionally presents a wide variety of works in a cheerful and casual gathering to conclude our year. On the 20th of October Melinda Smith, the owner of the Sydney inner city shop, Quiltsmith, will give a talk to The Quilt Study Group of NSW. The talk will be held at The Glover Cottages, 124 Kent Street in Millers Point and is titled "Quilting from Behind the Counter - A Shop Owner's Perspective Over the Years". 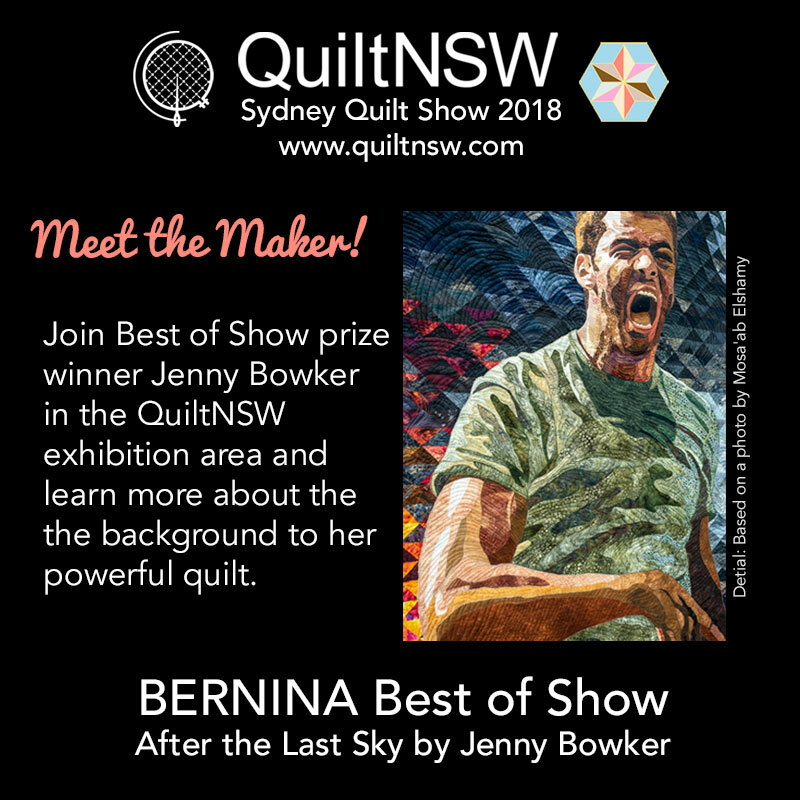 By using a timeline which shows how Quiltsmith evolved and is adapting to current market changes, Melinda will cover how Australian quilting has changed from her point of view as a quilter of many years' experience, a quilt collector, a bricks and mortar as well as online quilt shop owner, and as a sponsor of prizes at quilt shows. Of course, she will bring many quilts to show us as well. 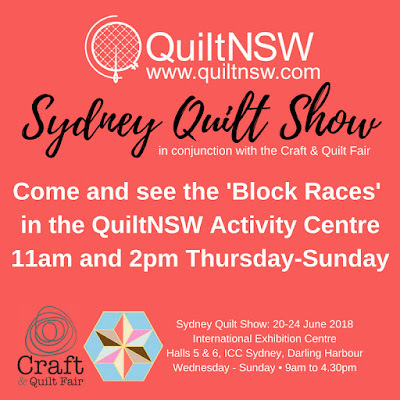 Please encourage everyone you know who is interested in quilting to come along to the Quilt Study Group of NSW talks. The Glover Cottages is a beautiful light-filled venue for the talks and it is an easy walk through The Rocks area from either Wynyard or Circular Quay train stations. Quilt NSW guild members pay $5, non-guild members pay $10. Afternoon tea is provided and the talks start at 2pm. Check the Quilt NSW website or the latest Template Newsletter for more details. 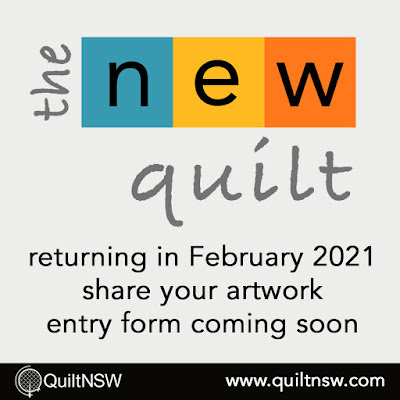 QuiltNSW is excited to relaunch The New Quilt at Hawkesbury Regional Gallery, Windsor, NSW from 5 February – 4 April 2021. 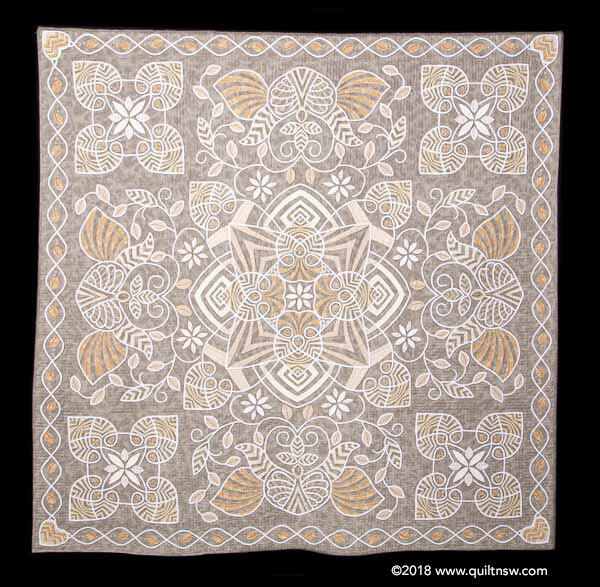 This juried survey exhibition showcasing the art of quilting is open to any textile artist resident in Australia whether or not they are QuiltNSW members. 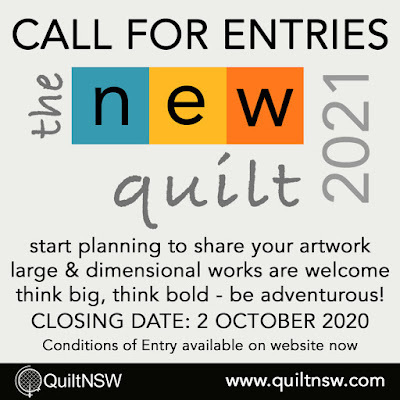 Entries close on 2 October 2020 - we know that is a way off but we want to give you as much notice as possible so that you can start planning your entry. Hawkesbury Regional Gallery is generously proportioned so large works and sculptural/dimensional works are especially welcome. Think big, think bold – be adventurous! Jurors: Judy Hooworth, Anna Brown and a representative of Hawkesbury Regional Gallery. Download Conditions of Entry or see the QuiltNSW website. 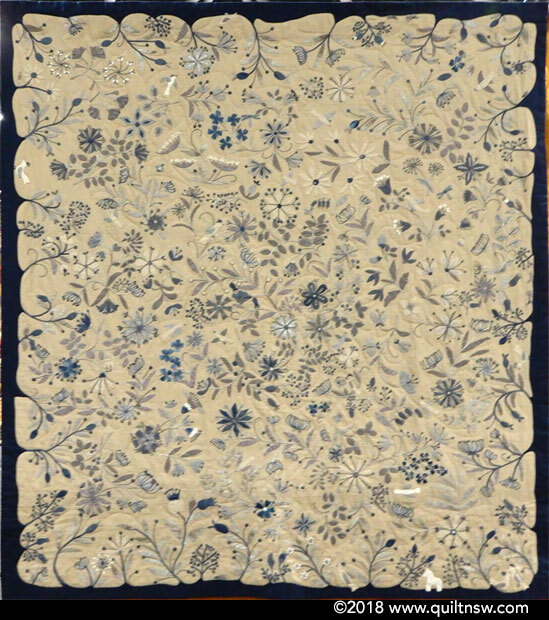 The Southern Quilters’ Finishing School will present their quilts at the October Friday Showcase. Photographed with their collaborative work of self portraits created for the “Southern Stars” category at this year’s Sydney Show, the group is about to celebrate their thirtieth year together. 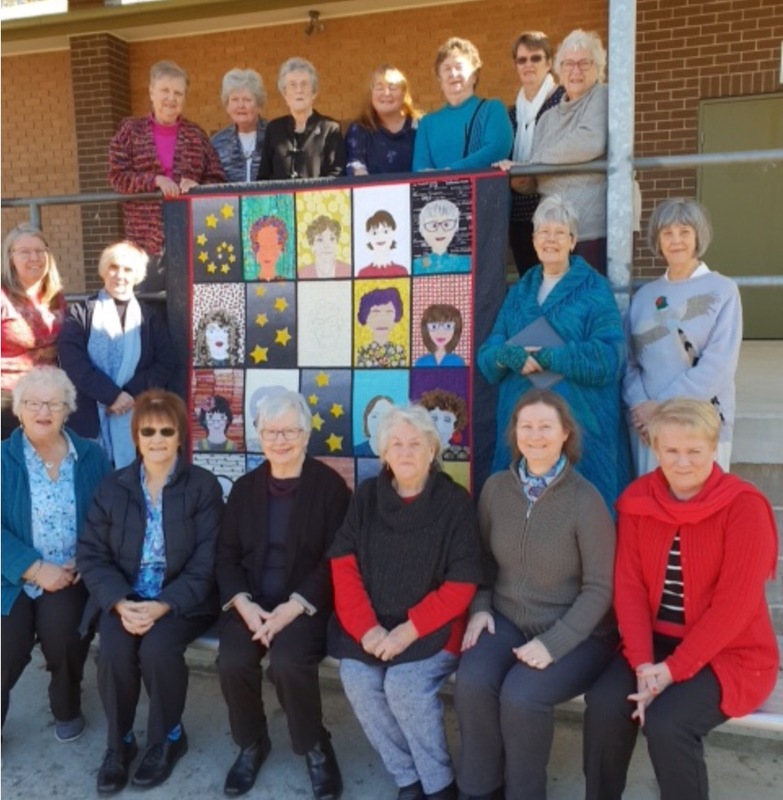 Formed in Caringbah in 1989 to encourage each other to complete unfinished quilts from workshops at Lady Hill Patchwork Shop, members work on their own and collaborative projects. 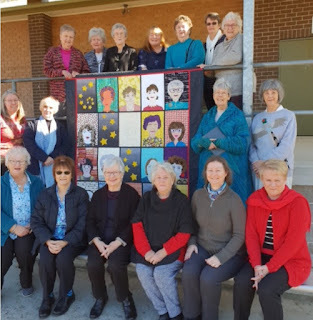 Now meeting weekly in Gymea, they participate in Mystery Quilt, UFO and Fabric Challenges. We look forward to viewing a variety of both group and individual works and to hearing the stories behind them. Friday Showcase is held on the first Friday of most months at our QuiltNSW office, 276 Pitt Street, Sydney, close to Town Hall Station. 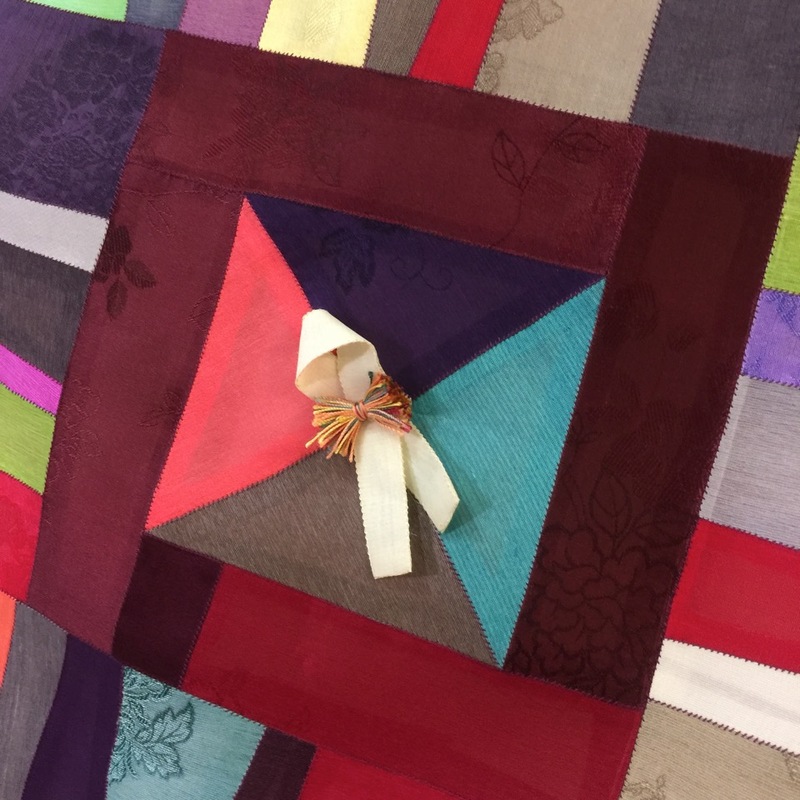 The Southern Quilters' presentation this Friday, October 5, starts at 10am, with an entrance fee of $5 for QuiltNSW members and $10 for guests. Pam Russell is the presenter for our September Friday Showcase. 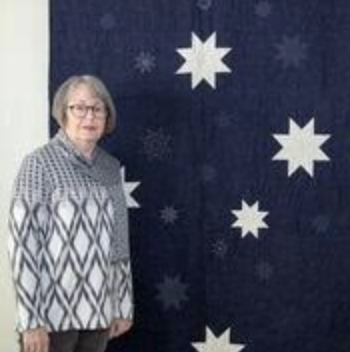 Pam’s journey as a quilter began in the mid 1980s when she took classes with Shirley Gibson, receiving a fine grounding in the basics of our craft. Pam talks of her long time love of hand piecing and quilting and over her years as a quilter her attendance at many workshops has expanded her repertoire of skills. During more recent years, Pam has enjoyed machine piecing and quilting, producing prize winning quilts. 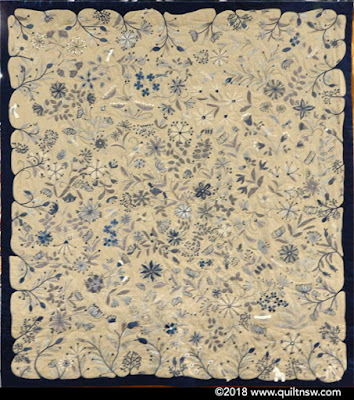 Pam’s current quilts incorporate a variety of surface design techniques she has learnt through her membership of The Australian Textile Art and Surface Design Association and amongst those on show this Friday will be a selection which display her exploration of textile art. Friday Showcase is held on the first Friday of most months at our QuiltNSW office, 276 Pitt Street, Sydney, close to Town Hall Station. Pam’s presentation this Friday, September 7, starts at 10am, with an entrance fee of $5 and $10 for guests. 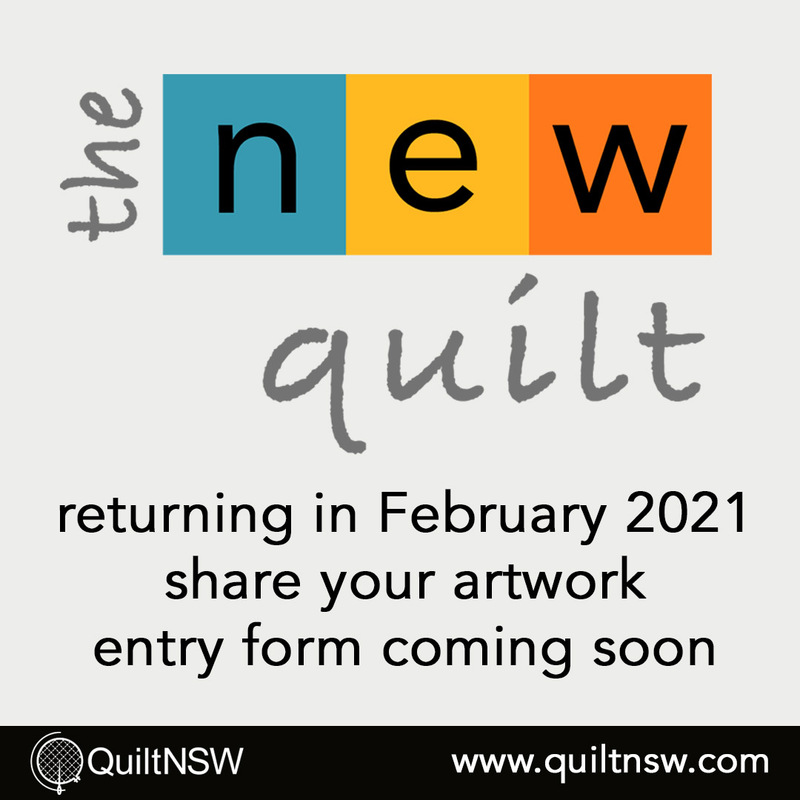 QuiltNSW is excited to relaunch The New Quilt at Hawkesbury Regional Gallery from 5 February – 4 April 2021. 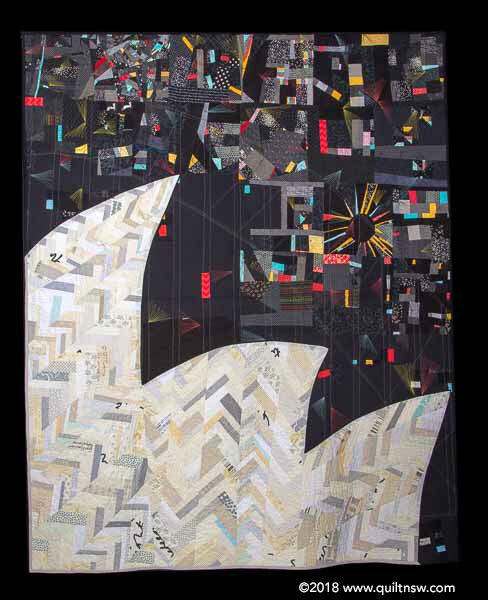 This juried exhibition showcasing the art of quilting is open to any textile artist resident in Australia whether or not they are QuiltNSW members. Start planning - think big, think bold, be adventurous! The 2018 QuiltNSW Retreat is fast approaching and there are a number of places still available for QuiltNSW members. The weekend is always most enjoyable with plenty of time for sewing and socialising. No set tasks or expectations, just come along and do as little or as much as you want. Only two hours north of Sydney it is an easy drive to Kurri Kurri where the retreat is held. If you have never been to a retreat before make this year your first. You are bound to have a good time and meet new and possibly old friends too. For those who have been in previous years and haven't booked in yet please get your booking in soon - you won't want to miss this one! Bookings can be made online or by phoning the office. All information and pricing is in the May 2018 issue of The Template. Please direct any enquiries to Linda Butcher the retreat coordinator at almhbutcher@hotmail.com. Claire Jeon Tarim is the presenter for our July Friday Showcase. Born of architect and calligrapher parents, it came as no surprise to Claire that she and her brothers and sisters developed artistic skills and that three of the four siblings of the family graduated with art degrees. Claire’s major studies in illustration and design led to her early work in freelance illustrating. Her love of natural fabrics, texture and colour now combine in her silk and ramie Jogakbo (‘jogak' the Korean word for pieces and ‘bo' translating as wrapping cloth), the creation of which she says brings her both mental and physical pleasure. We look forward to seeing a range of Claire’s Jogakbo pieces, which highlight the combination of exquisite fabric with featured hand-stitched seams. Friday Showcase is held on the first Friday of most months at our QuiltNSW office, 276 Pitt Street, Sydney, close to Town Hall Station. Claire's’s presentation this Friday, July 6, starts at 10am, with an entrance fee of $5 for members and $10 for guests. The votes are in! First Prize Viewers' Choice goes to Anne Blythman for Floral Odyssey (Design Source: pattern by Yoko Saito). This prize is sponsored Mid Coast Fabrics Online and MiniJumbuk. Second Prize Viewers' Choice goes to Dianne Johnston for Abu Dhabi Memories. This prize is sponsored by Dyed and Gone to Heaven and MiniJumbuk. 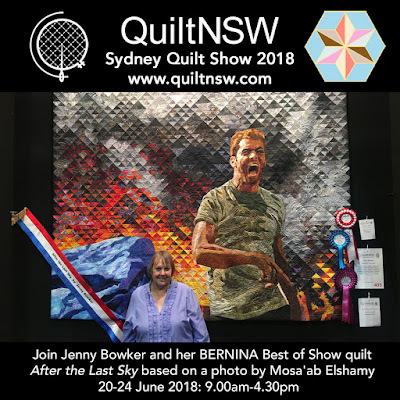 View all the prize winning quilts in the Sydney Quilt Show 2018 Online Gallery. 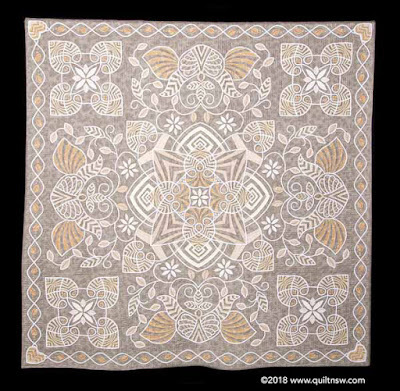 4pm drawing of the Super Quilt Raffle 2018. Winners will be notified by telephone and prizes not collected will be posted at the winner’s cost. 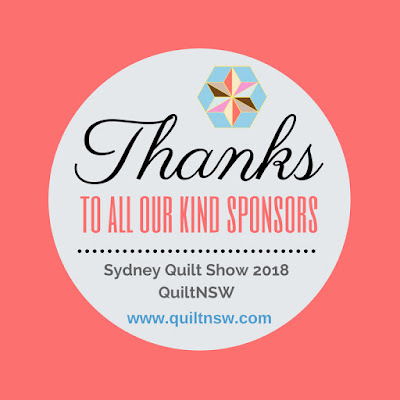 We also take this opportunity to thank ALL of the Sydney Quilt Show 2018 Sponsors as listed on the QuiltNSW website. Their generosity and support are much appreciated. Please support them in return. 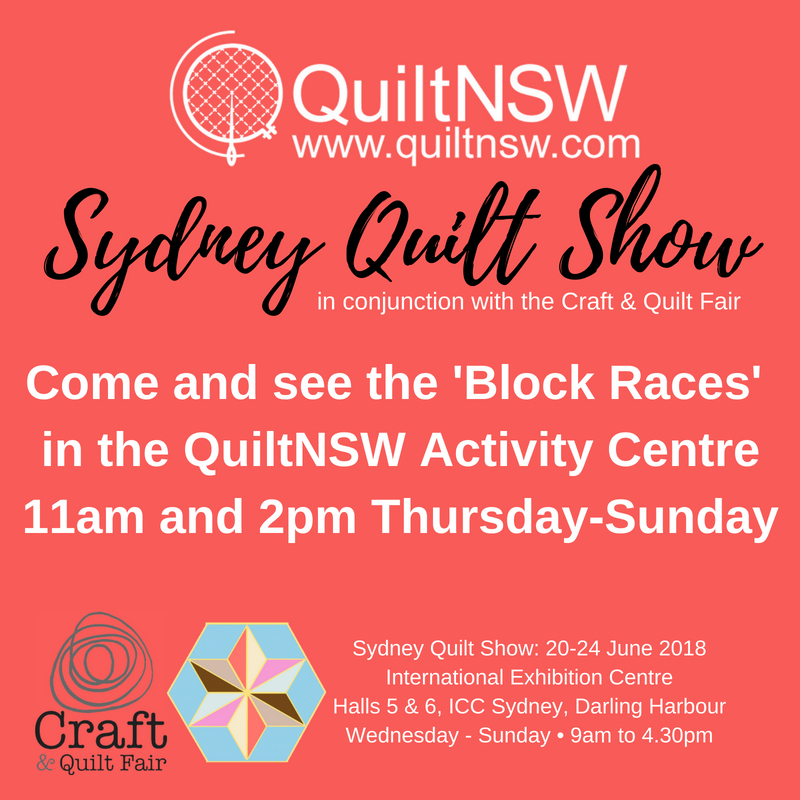 QuiltNSW welcomes you to Day 2 of the Sydney Quilt Show 2018 from 9am-4.30pm on 21 June at the International Convention Centre Sydney at Darling Harbour. This year we will be running ‘Block Races’ at 11am and 2pm every day from Thursday to Sunday. Members working in teams of two will be challenged to complete star blocks in the shortest possible time with a leader board running for the whole four days. In fact, there will be two options, a traditional block, or an improvisational block for the adventurous among us. 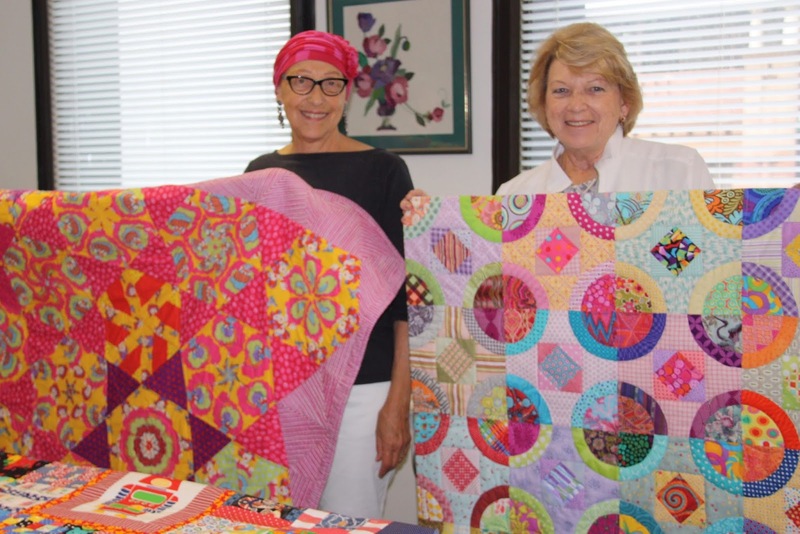 All blocks will be used for charity quilts.